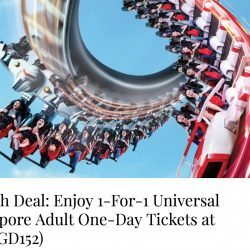 Till 27 Feb 2018 Resorts World Sentosa: Enjoy 1-For-1 Adventure Cove Waterpark & Universal Studios Singapore Adult One-Day Tickets with Maybank Cards! Enjoy exclusive savings to Resorts World Sentosa Singapore with your Maybank Credit/Debit Card! Use your Maybank credit/debit card to get 1-for-1 Adventure Cove Waterpark or Universal Studios Singapore adult one-day tickets! Offer is valid till 27 February 2018 for visits from 1 March 2018 to 25 May 2018. 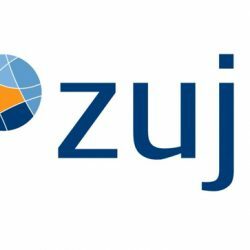 Book your hotel for your vacation at ZUJI and enjoy 12% off with this coupon code when you pay with a Maybank credit or debit card! Valid till 10 December 2017. 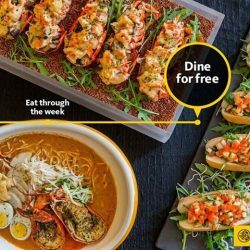 Till 30 Sep 2017 Maybank Cards: 1-for-1 Buffet Deals and More! 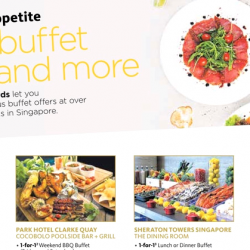 Maybank Cards let you enjoy delicious buffet offers at over 30 restaurants in Singapore! Holiday Inn Singapore, Swensen's, Park Hotel and more! Offers are valid till 30 September 2017. 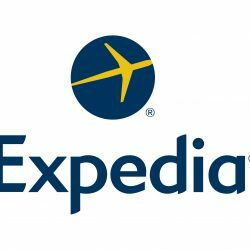 Save up to 50% plus additional 10% discount on your hotel bookings at Expedia with this coupon code using your Maybank card! Valid for hotels in Tokyo, Osaka, Kyoto, Hokkaido, Taipei and Seoul. 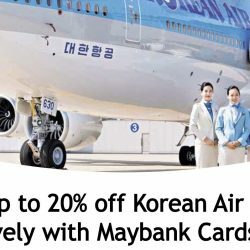 Book by 28 Feb 2017 Maybank Cards: Enjoy Up to 20% OFF Korean Air Flights! Enjoy up to 20% off to more than 60 destinations on Korean Air, including Korea, Americas, Japan and China with your Maybank Card! 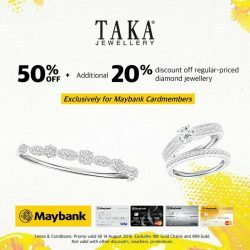 Simply key in the promotion code upon booking and charge to your Maybank Credit or Debit Card to enjoy this promotion! Book your tickets by 28 February 2017. 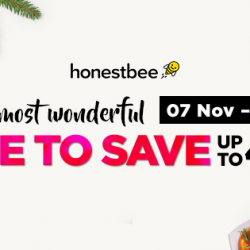 Save time to shop for your groceries by using Honestbee! You can shop from multiple stores and get your groceries delivered to your doorstep! 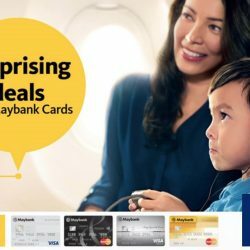 Exclusively for Maybank Credit Cardmembers, get $2 off + free delivery with this coupon code! Plan your next getaway to your favourite destinations with exciting fares from $168 on Singapore Airlines with Maybank Cards! Plus receive S$50 cash rebates with a minimum spend of S$1,500. Offer ends on 31 December 2016 for travel from 1 January 2017 onwards. Book your tickets with your Maybank Card today! 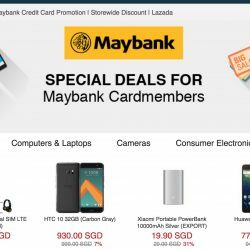 Till 27 Nov 2016 Samsung Pay: More 1-for-1 Offers with Maybank Cards + $10 Rebate! 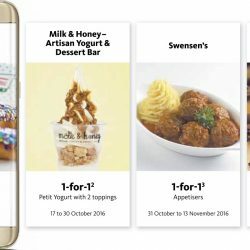 Samsung Pay has already good rewards such as 1-for-1 Movie Ticket and 1-for-1 Ice Blended Drink but if you have a Maybank Card, you enjoy even more 1-for-1 offers! From 3 October to 27 November, enjoy exciting 1-for-1 deals at Krispy Kreme, Milk & Honey, Swensen’s and OldTown White Coffee. Simply pay with your Maybank Credit or Debit Card on Samsung Pay! Also enjoy a $10 rebate with a minimum spend of $30 with Maybank Cards on Samsung Pay from now till 31 October 2016! Limited to first 10,000 customers only. From home appliances, consumer electronics to fashionable wear, there are bound to be something for everyone at Lazada.SG. Enjoy 10% off when you spend a minimum of S$75 with Maybank Cards from now till 31 October 2016. Visit maybank.sg/online for full details. Terms and Conditions apply. Celebrate this Mid-Autumn festival with exciting mooncake privileges! 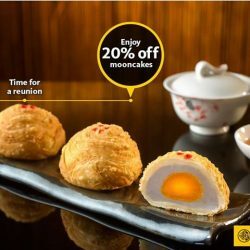 From 29 August to 15 September 2016, enjoy 20% off mooncakes from Si Chuan Dou Hua Restaurant with your Maybank Card! Visit http://goo.gl/IlCmRa for details. Terms and Conditions apply. Pamper your skin with natural ingredients. 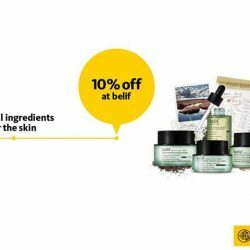 From now till 31 October 2016, receive a complimentary 5ml belif Peat miracle revital eye cream and enjoy 10% off all regular-priced items with minimum S$80 spend with Maybank Cards. Visit maybank.sg/retail for details. Terms and Conditions apply. Feast on a different dining theme daily from Mondays to Sundays at Hotel Jen Tanglin Singapore. Till 31 December 2016, 1 dines for free with every 2 paying adults for daily Buffet Dinner with your Maybank Card! Visit http://goo.gl/nIQnTz for details. Terms and Conditions apply. It has never been a better time to explore UK and the world with British Airways now. Whether it's the historic streets of London, stunning architectural landscape of Sydney or chic style of New York, Maybank Credit and Debit Cards bring you further for less on all classes of travel with British Airways. Enjoy all-inclusive airfares from S$668 onwards. From 9 to 26 June, book your dream accommodation with Expedia and save up to 50%+ additional 10% with Maybank Cards. 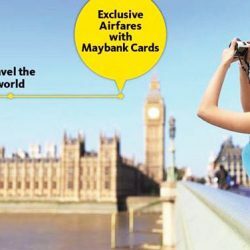 Visit maybank.sg/travel for details. Terms and Conditions apply. 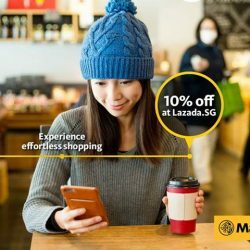 Shop at Lazada now and enjoy up to 14% off on min. 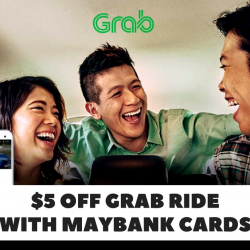 $50 purchase with Maybank Cards! Offer is valid till 31 December 2016. 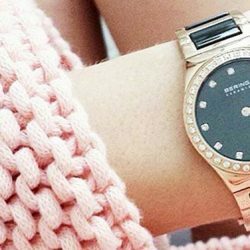 Look and feel feminine for dates and girls night out with a gorgeous BERING watch that stands out with its sparkly Swarovski crystals. From 16 May - 14 Aug, Maybank cardmembers enjoy 15% off any regular priced watches. Enquire in-store for more details. 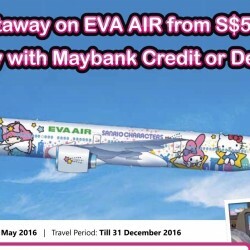 Getaway on Eva Air from S$504, exclusively with Maybank Credit or Debit Cards! Destinations include Taipei, Houston, Los Angeles, San Francisco, New York and more. You can even ride on the Hello Kitty Jet to Taipei and Houston! Book now at airfares.com.sg or call 6538 0318 now. 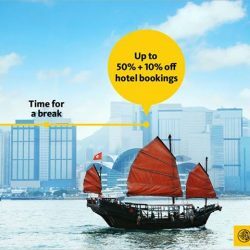 Book your hotel through Agoda using your Maybank card and get an additional discount of 5%! Valid till 31 December 2016. 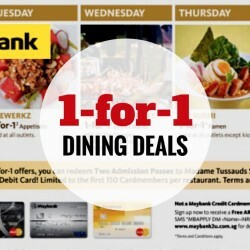 Enjoy exclusive daily 1-for-1 dining deals with Maybank Cards! 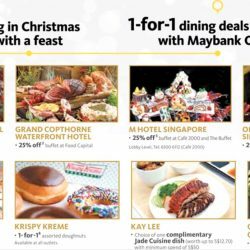 Maybank's 1-for-1 dining offers are available every weekday from April to December 2016 with Maybank Credit or Debit Cards. Fly to Hong Kong with Cathay Pacific from S$248 all inclusive! From now till 5 April 2016, enjoy exclusive Economy Class airfares on Cathay Pacific to over 40 destinations worldwide! In addition, earn up to 1,000 bonus Asia Miles when you book online with your Maybank Credit or Debit card.